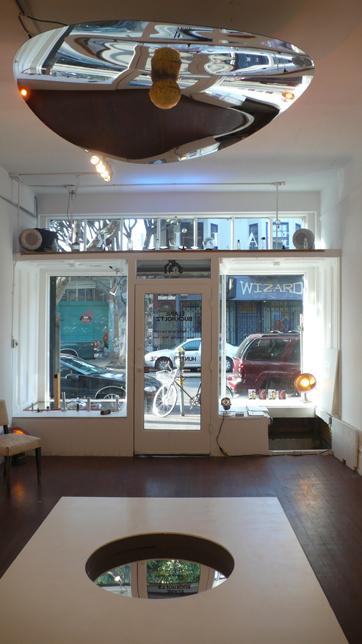 During Carnaval a few weeks ago, a friend and I took a break and visited Triple Base in the Mission District, where we saw Elaine Buckholtz’s solo show Jars Films Inside. For this exhibit, Buckholtz has turned the entire gallery into a single immersive work of art that is simultaneously a performance space. Visitors can interact with the objects in the gallery and use them to create their own experience of the work. [Elaine Buckholtz. Gallery installation view. 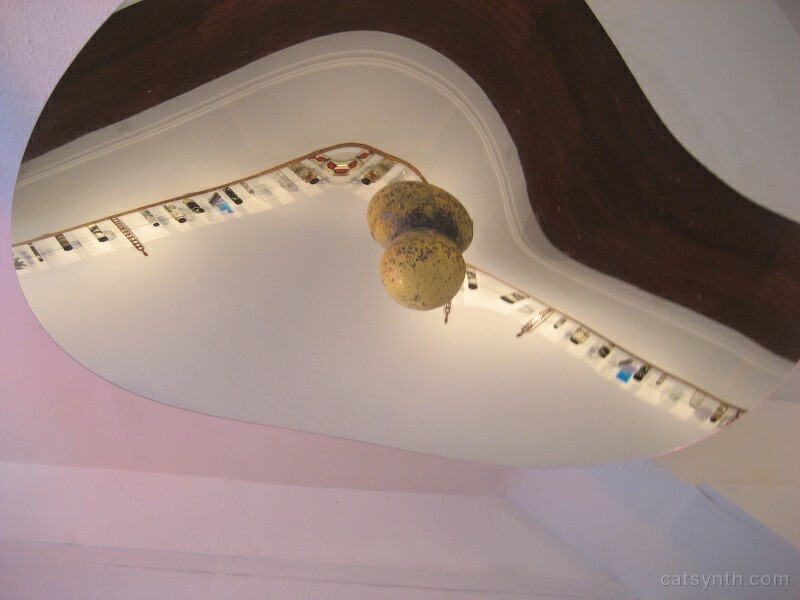 The first thing one notices upon entering the gallery is the large curved mirror in the center, and the lined with small glass jars, beakers, vials of all sorts filled with various objects. They seem like specimens from a “scientific” collection of a previous century, pretty or interesting things trapped and preserved in jars. The mirror was rotating slowly, and the reflection of the bottles on the wall create a black line that undulates across the surface, and occasionally breaks into two lines that then reconnect. On close inspection, the vessels contain photographic film, glasses, pebbles, tiles and other objects. It seemed they were all selected to play with the light that passes through the glass, obscuring or modifying it. [Elaine Buckholtz, Jars filmed inside. Indeed, the installation as a whole seems to be about playing with light, both directly an indirectly. There is the light through the jars, the often translucent objects in the jars, and the large central curved mirror reflecting the jars and the viewers. There are also a number of handmade optical devices that viewers can pick up and use to view the light of the installation in even more ways. This was an exhibit that invited exploration and play. This can be a bit surprising for regular gallery visitors who are used to the tradition of “look but do not touch” in art, and I probably would not have picked anything up without having been invited to do so by the staff and thus missed out on the full experience. In the basement of the gallery (which is accessed via a trapdoor and a ladder) was Hunter Longe’s installation entitled Perception Projection Delay. It consisted of a large drawing of spiral, with similar moving image projected onto it, given a sense of constant and somewhat disorienting motion. The clean curves of the spiral, flatness of the screen were a contrast to the rough surfaces of the basement, but the silence and overall darkness seemed to fit together. Especially coming after the vibrant colors and crowds of Carnaval, the calmness of the environment and the patterned motion of the image seemed very inviting, at once meditative and a canvas for fun and imagination, and it captured our attention for some time. The exhibition will remain on display at Triple Base through July 3, so do check it out if you are in the area.